This page is an attempt to preemptively answer some of the common questions I am asked many times by different people. Please read this FAQ before emailing me. You may find the answer to your question here. This FAQ specifically covers my own engine design, but much of the information is applicable to amateur built turbine engines in general. Q. Could you please post a diagram of your engine and a simple explanation of how it works? A. The turbo charger is the heart of the engine, and the most important part. A turbo charger consists of an air compressor and a turbine connected by a common drive shaft. The compressor section of the turbo charger takes in lots of air and compresses it. The high pressure air is then ducted through a PVC air pipe and into a steel combustion chamber. Inside the combustion chamber is a steel flame tube or liner. Air passes into the liner through holes drilled in it. Fuel is mixed with the air and ignited by a spark plug inside the liner. 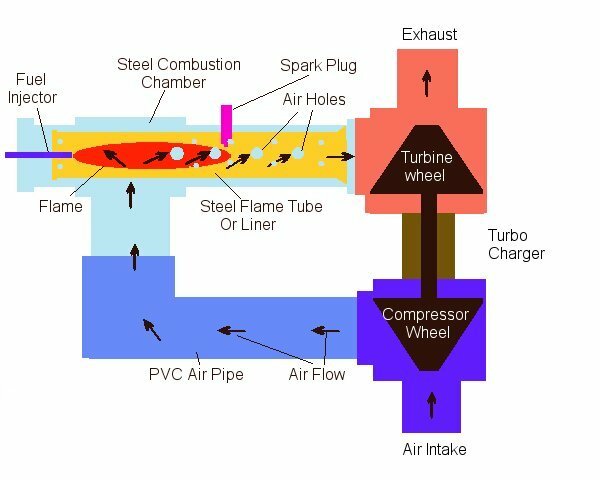 The burning fuel heats the air and causes it to expand and rush out of the exhaust end of the chamber which is connected to the turbine section of the turbo charger. As the exhaust gasses blow through the turbine section they spin the turbine wheel. The turbine wheel is connected to the compressor wheel in the compressor section and provides the energy for driving it. An outside source of energy is needed to start the engine by spinning up the turbo charger, but once it is running the engine keeps going under it's own power as long as it keeps getting fuel. Q. What is the purpose of the flame tube or liner? A. The flame tube (also called a liner) fits inside the combustion chamber. It serves three main functions. First, the flame is contained inside the tube and prevented from touching the walls of the combustion chamber which helps keep the chamber from overheating. Second, it slows and diffuses the air flow through the combustion chamber and prevents the flame from being blown out by the air blast. Third, the pattern of holes drilled in the flame holder allows for complete combustion of the fuel and efficient mixing and heating of the air. Q. Why do you use propane as a fuel? Can I use something else? A. I use propane to fuel my engine because it is probably the easiest to use and most economical fuel available. It provides it's own pressure and doesn't have to be pumped. It vaporizes into a gas at normal temperatures. It is stored in liquid form which means that a small tank can hold a lot of fuel. It is cheap and available almost everywhere. Most liquid fuels need to be pumped under considerable pressure and thoroughly atomized so they mix well with air and burn efficiently. Other compressed gasses are more expensive and the tanks don't hold as much. Propane is probably the ideal fuel for an experimental engine. Other fuels will work. Anything that can be mixed with air and will provide enough BTUs when burned can be used as a fuel. Gas turbine engines have been run on everything from Hydrogen gas to coal dust. Most commercially built engines are designed to run on kerosene, AKA jet fuel. Diesel fuel and alcohol are also popular fuels. Many experimenters start out with propane. Once they have a working engine and a little experience, some people convert to liquid fuels like kerosene or diesel. I don't recommend attempting to use any sort of "exotic" fuel because it will simply add more unknowns to an already complex project. Q. Do you have a schematic of your ignition system? A. This is probably the most asked question, but I don't know why. The ignition system is by far the easiest part of the engine to build, at least for a non-machinist like me. 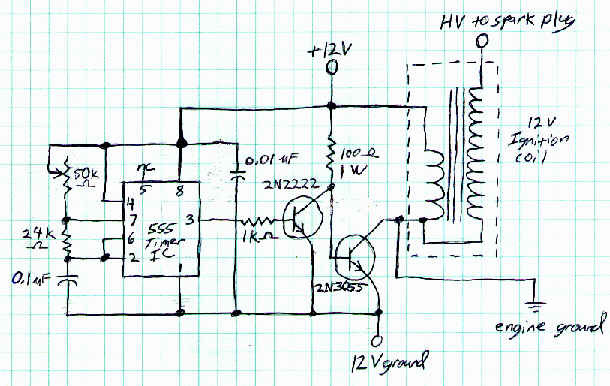 Above is a schematic of the high voltage power supply I built to power the spark plug on my engine. It produces a continuous spark. Note that the 12 volt ground and engine ground are separate, and must not be connected together. The 100 Ohm resistor marked 1 Watt is the only high wattage resistor. The others can be whatever you have laying around. Adjust the 50K pot for a hot continuous spark. I forgot to include the 120V to 12V transformer, bridge rectifier and electrolytic capacitor that allow me to run this unit on 120V AC power. Just about any 12V power supply that can provide a couple of Amps will also work. Old computer power supplies work great. Q. How do you keep the flame tube centered in the combustor? A. This is another question I get a lot. The flame tube is restrained from sliding back and forth in the combustor by the spark plug which is threaded into a hole in the side of the combustion chamber and passes through a hole drilled in the side of the flame tube. The flame tube is centered in the combustor at the turbine end by being flared out to the inside diameter of the combustor. At the fuel injector end it is centered by three screws, equally spaced around the circumference of the combustion chamber, that pass through threaded holes in the wall of the combustor and press against the flame tube to keep it centered. This simple design prevents the tube from moving in any direction. Q. What sort of hole pattern did you use in the flame tube and what are its dimensions? The two rows of holes on the far right (fuel injector) side of the flame tube were a mistake and had to be closed off. The 4 1/8 inch holes are not visible but they are drilled in the cap on the right side of the tube surrounding the large opening for the fuel injector. 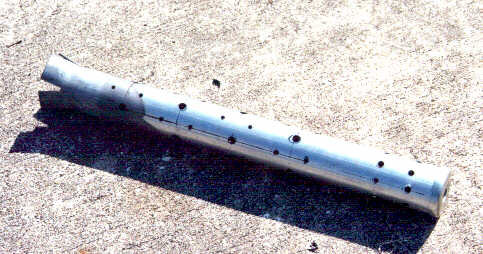 Note the flaring of the left (turbine) side of the tube. My hole pattern is not ideal. Designing the hole patterns in flame tubes is more a black art than a science. There are no hard and fast rules. I get the impression from the reading I have done that even experienced turbine engineers resort to trial and error in this area. Feel free to experiment. You may well come up with something better than mine. Q. Can you send me plans or a complete parts list for your engine? A. These are also very popular questions. Unfortunately the answer is no. The engine was improvisation from beginning to end. I just banged it together with whatever I had laying around or could obtain easily. I didn't plan very much in advance and I didn't keep very good track of all the little bits that went into it. My purpose in putting up this web site was not to inspire lots of people to create exact duplicates of my engine. My purpose was to hopefully inspire others to improvise their own engines using talents, tools, materials and ideas of their own. With a little thought and effort you can probably produce an engine better than mine. Q. Where can I get a turbocharger and the other parts needed to build an engine like yours? A. Well, you can head down to your local junk yard like I did for most of my parts. That's where you will probably find the best deals. If you don't feel like getting all greasy and sun burnt out in the junk yard, you can check out Ebay There are always lots of turbochargers for sale there at reasonable prices. There are also all sorts of other bits and pieces like fuel pumps, oil pumps, and even parts from real jet engines. Occasionally you'll even whole working jet engines for sale there. Probably the most expensive option is buy your parts from an auto parts store. While this is a very expensive option, the up side is that you'll get exactly the parts you want and they will be factory fresh and guaranteed to work, though using them to build a jet engine will probably void any warranty. Q. Why did you make the air duct from PVC pipe? A. PVC pipe and fittings are cheap and easy to work with. PVC will withstand considerable air pressure, but does not stand up to heat. I only use it for moving relatively cool air, and connect the duct to the cool end of the combustor. At high boost pressures PVC is not a good choice because the compressed air will be very hot. Q. How much did it cost you to build your engine? A. I spent somewhere between $150 and $175 over the 4 months it took me to build the engine in it's original form. Your costs may vary depending on where you live and how well stocked your workshop is. I already had all the tools and some of the parts needed before I started. Q. What's all this stuff about oil pumps and cooling water? Are they really necessary? A. The turbo charger needs oil for it's bearings and water passing through it to prevent it from overheating. On a car the oil comes from the engine lubrication system and the water comes from the engine cooling system. Off the car you will need to provide them somehow. This adds to the complexity of the engine, and can turn it into a real plumbers nightmare, but it's very necessary. Q. Just how dangerous is this hobby? How could it hurt me? A. Make no mistake, this is a dangerous hobby. There are lots of different ways to injure or kill yourself with a gas turbine engine. Parts of the engine run hot enough to glow and will burn you badly. The compressor and turbine wheels spin at unbelievable speeds. Either one or both could fail without warning and send high speed shrapnel blasting through the turbo charger casing with the force of a hand grenade going off. There is always the danger of a fire or explosion from leaking fuel. An oil line could burst and spray you with scalding hot oil. You must be careful around the air intake to prevent foreign objects (including parts of your body) from being sucked in. And lastly, wear ear protection or your engine will make you deaf. Q. How much thrust does your engine develop? A. Only a few pounds at the present time. My nozzle is not really adequate for efficiently producing thrust from the tremendous mass flow through the engine. I may make a better nozzle sometime in the future, but my future plans for the engine mainly involve adding a second turbine to extract shaft horsepower from the engine. Q. Why haven't you done any work on your engine lately? Have you given up? A. I have several other hobbies (my main hobbies are astronomy and telescope building). They take up the bulk of my free time. I also have a full time job and a side business on the internet that prevent me from having too much free time to devote to my hobbies. I haven't given up on the engine, but it is on the back burner for now. I do have future plans and am always on the lookout for good ideas related to home built turbine engines. I hope to have some more free time in the (hopefully) not too distant future to spend working on the engine. Q. What are your Future plans for the engine? A. First I want to rebuild the combustion chamber since I believe it's small size is constricting the air flow and preventing the engine from performing as well as it could. Next I want to convert to liquid fuel. Propane is a great fuel and easy to work with but It limits me to tank pressure. A liquid fuel like kerosene or diesel could be pumped in at much higher pressures. A longer term goal is to add a second turbine and extract some useful horsepower from the engine. Q. Why didn't you answer my email? A. Sigh. I try but the volume of email this web site generates is just beyond belief. There simply isn't enough time to answer all or even most of them. So don't take it personally if you don't get a response. Be assured though that I do make a serious effort to at least read it all. Q. Why build a jet engine? A. If you have to ask, you'll never understand.